Throughout 2012, Chaos Created will be bringing Langeroo to many new platforms. We will be focussing on apps, across mobile platforms, as a way of reaching parents and home users. Our subscription model with remain as our primary resource for schools, whereas our apps are built to work alongside our subscription service so that parents can work with their children, using the same sets of words and the same course structure, from home. We will be releasing apps that will fit into one of two categories. Langeroo Toolbox apps will consist of tools and resources, whereas Langeroo Adventures will be game-driven, utilising the same word sets as our Toolbox apps. All of our apps will work alongside our Langeroo subscription service and the National Curriculum. Langeroo is already in use in primary schools worldwide, teaching English as an additional language. It is also being used, widely, in the UK teaching English both as an additional language and as a primary language in primary schools and nursery schools. Today, we are announcing Langeroo English Flashcards Level 1 for Windows Phone. Langeroo apps are designed for parents to use with their children as a way of teaching English words and phrases. You can use this app to teach words with the Flashcards Tools, and also to test learning with our multiple choice Flashcards Games. This pack features over 160 words, each illustrated with gorgeous and inspiring graphics and narrated by a TES advisor and primary school teacher. This set includes Flashcards and Flashcards Games for nine topics – My Face and My Body, Colours, Eating, My Family and Friends, Numbers, Shopping, My Clothes, Shapes and Playing. Our apps are based on our educational subscription service, which takes its structure from the English National Curriculum and is in use in schools, internationally, as a way of teaching English as an additional language, and to nursery and primary learners for teaching English as a first language. We will be brining Langeroo Apps to many more platforms later this year including Windows 8, iPhone and Android devices (more details here). In the meantime, you can grab Langeroo’s first app from the Educational Games section of the Marketplace. It is available, right now, for FREE! Get it now by clicking the link below! 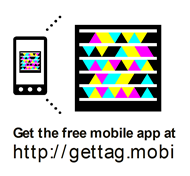 Or, scan the Tag with your phone!